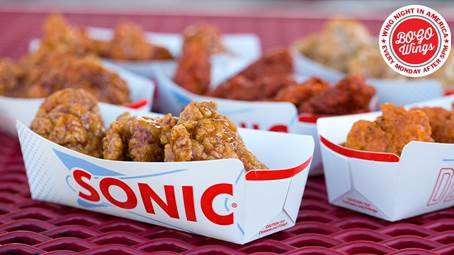 BOGO FREE BONELESS WINGS EVERY MONDAY NIGHT @ SONICS - EAT WITH HOP! SONICS IS GIVING OUT BUY ONE GET ONE FREE BONELESS WINGS! This deal is until December 20 on every Monday after 5pm until close. Mention this deal (no coupon needed) to order a pack of 6-wings / 12-wings / 24-wings and get another order free. You can order up to 2 different sauces if you order 12 or 24 wings. ***At the location I went to (near Cal State Fullerton), I was able to order a 6 pack of wings and got another 6 wings for free with a different flavor! The Sonics that I went to was by CSUF. I ordered 6 Buffalo wings and 6 Garlic Parmesan Wings. The total was around $4 for 12 wings because I got the second 6 free! What an outrageous deal! I can't believe this is going on for another month too! Woo! Best of all, there was no need to mention this deal. While ordering, the awesome person taking my order mentioned asked me if I knew about the deal and just applied the awesome discount automatically! How kind of that person! Anyways, the wings are boneless which honestly aren't my fave but it's bogo free so why not? Right? The Buffalo wings were too saucey. I felt like it was swimming in buffalo sauce for ages and then decided to take a rest and landed in a to-go box. I didn't enjoy the buffalo wings very much and it was too salty. The Garlic Parmesan wings were great! The flavor wasn't too strong and the wings itself were still a bit crunchy! Yay! I thought the amount of flavor was just right. Not too much and not too little but my bf thought it could have been more flavorful. Anyways, I'd totally get this flavor again!